I really wasn't planning on making any Easter treats this year. I was content to munch on my little bags of Cadbury mini eggs and to just stockpile Easter goodies (for my son, of course...) from Target. But then I watched The Pioneer Woman's Easter episode and saw the rice krispies eggs. Since I had about half a box of the cereal sitting in the pantry, I just couldn't resist! The Pioneer Woman stuffed a Cadbury mini egg - those delicious little chocolate eggs ubiquitous at Easter - inside each of her krispy eggs and since I love any excuse to buy and eat more of those crispy, creamy, dreamy chocolate eggs, I was all for it. But then I was telling my husband about my plans and he had a funny idea. Why not stuff a Cadbury creme egg (he's the creme egg lover in the family) inside instead? Then, you've really got the whole egg theme going. I think he thought that's what I meant in the first place when I was describing the project but after he said it, it seemed such a hysterical idea that I had to try it. So I did and you can see what I ended up with! Those eggs totally cracked me up (haha...corny joke alert). We all had a good giggle out of these creme-egg-within-an-egg eggs! Besides the creme eggs, I did make a bunch of rice krispies eggs filled with a mini chocolate egg inside and also a few with some classic M&M's tucked into them too. I was a little worried about the rice cereal setting before I had time to mold each of them around the plastic egg but it really wasn't a problem if you work relatively quickly. Being rather impatient and given that fear of the cereal setting up, I started with large plastic egg molds before switching to a few smaller ones. I think the smaller ones look a bit more realistic but the larger ones make quick work of it. I had a good time whipping these eggs up. These tasty little eggs, with their chocolaty surprise inside, are just plain fun. I had just about 4 1/2 cups of rice cereal left at home so I adjusted the standard rice krispies recipe accordingly (you usually start with 6 cups of cereal so basically, I made three-quarters of the typical recipe). If you make a full recipe, you'll get a good dozen or so large eggs (about 3x2 inches), and obviously more if you use smaller plastic eggs as molds. A mix of the two sizes is fun; for little hands and portion control, the little ones are a good choice. However, in the case of the creme egg-filled ones, you will need to go with a large mold. I use my dutch oven for times when I make cereal treats. It retains heat well to keep the mixture warm a bit longer. You do want to work pretty quickly while the mixture is warm and easier to handle/mold that way. This is a good project to recruit a helper for. Spray the two sides of your snap-apart plastic egg mold with some cooking spray. Spray your hands as well so you'll have an easier time working with the sticky mixture. Fill one half of the mold with the rice cereal mixture - pack it in firmly but not too intensely jam-packed. Press a chocolate mini egg (or a few M&M's or any other egg-shaped (or not) treat of your choice) into the center, and then fill the other half of the egg mold with more of the cereal mix. Now just press the two parts together. You'll hear a bit of a crunch as they meet and once together, release the rice krispies egg from the mold, decorate, and set it in an egg carton. Repeat with the remainder. In the case of filling with a Cadbury creme egg, you will need to use a large plastic egg mold. Fill the plastic egg halves with a thin layer of the rice cereal mixture to make a little more room for the creme egg. I tried seeing if I could just mold the rice cereal mixture around the creme egg freeform but it just slides off and doesn't work without the plastic egg mold. I considered making chocolate or cocoa eggs using this recipe (since eggs come in brown, after all) but I stuck with the "plain" and decorated them lightly with some pastel-colored sanding sugar and a little bit of sprinkles. I found it's probably best not to wait too long to decorate them since the sprinkles stick better when the treats are still a tad warm. I hope you have an egg-cellent Easter weekend! Over low-heat, melt butter in a dutch oven (or large heavy-bottomed saucepan). Add marshmallows and stir with a rubber spatula until completely melted. Turn off the heat, add cereal, and fold together until fully incorporated. Lightly spray the inside of a plastic egg with cooking spray. Spray your hands as well for easy handling. To fill with a mini chocolate egg, first fill each side of the plastic egg with the cereal mixture. Pack the cereal fairly firmly, slightly over-filling one side. Press a mini chocolate egg into the center of one side, then bring the two sides together and press firmly to mold (you should hear a slight crunch). Remove the cereal egg from the plastic mold, decorate, and place in an egg crate to set. To fill with a Cadbury creme egg, follow the same instructions except fill the plastic molds with a slightly thinner layer of the cereal mixture to make more space to fit the larger creme egg within. This is wonderful! I like the way your husband thinks. I haven't had one of those eggs in years - but maybe somebody will come across a good after-Easter candy sale and pick up a few! This is just adorable, creative, and oh so tasty! Hope you and your family have a blessed Easter! it's kinda crazy, Tricia...but holidays are the best excuse to make things like this. My husband loves his creme eggs while I hoard those mini chocolate eggs. Anyway, have a great Easter weekend. Hope there's lots of sunshine coming your way! These are seriously so cute!! Love these so much, and they're perfect for Easter. I'm so bad about making seasonally-relevant desserts but these are calling my name! How cute! It may sounds crazy, but I have never had a Cadbury creme egg! Now, I am super curious. Totally need to get some! It is such a cool idea to shape the rice krispies in a plastic egg. The sprinkles on top is a really nice touch! My husband adores the creme eggs so I buy some for him. Me? Cadbury mini eggs all the way! haha. On the show, Pioneer Woman sprinkled hers with bright colors and that makes for a more vibrant look...I didn't think too much about it. Honestly, all I was thinking about is how much sprinkles will I have to sweep up! Awww...that's crazy! Thank you for that! Oh my gosh, these RK easter eggs are the cutest!!! Stuffing them with the cadbury creme eggs is genius!!! I love that your husband is thinking like a food blogger now too hehe :) Finding that surprise inside would put a big smile on all of us for sure too - so fun and festive! Hope you all have a great Easter! I don't bake anything special for Easter. 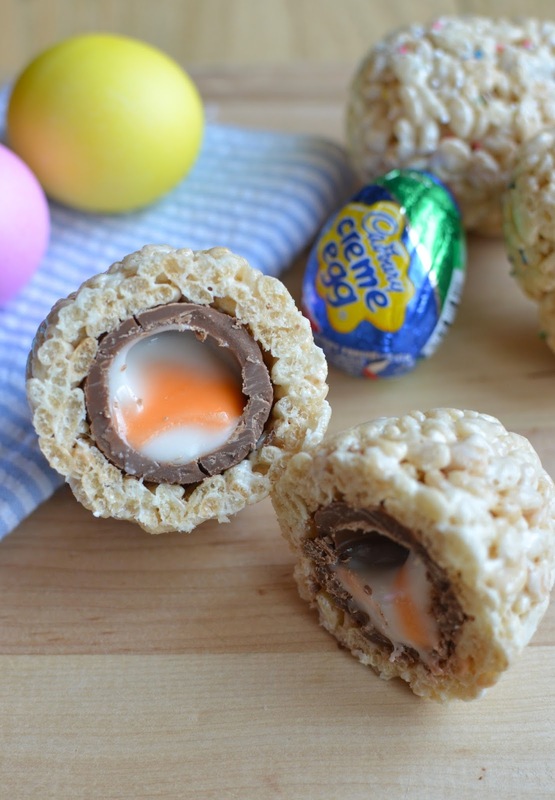 Love your rice krispies eggs! You too have a happy long weekend! I hear you. Just do what you want, right? Sometimes I want to do something, sometimes I don't. I just go with the flow. You have a lovely weekend, Angie. OMGosh Monica - these are brilliant! I would've never thought to stuff a Cadbury egg in there, but just by looking at it, I can tell it tastes amazing! Pinned! I wouldn't have ever thought of it either! Credit to my husband and when he said it, I just had to try it. Glad I did. Thank you. These Easter eggs are so cute! I never make cute things like that so it's always fun to watch my blogging friends do some creative stuff! I can rarely manage anything cute so this is as 'good' as it gets, Julia. ; ) I love looking at other people's creative spins on holiday treats, too. I've tried this with fruity pebbles but never rice krispies! Love how adorable these are! I made fruity pebbles bars and I swear those colors were mesmerizing me! The kids loved it (too much)! How fun! Mini cadbury eggs are my favorite Easter candy, but the creme eggs aren't too bad either ;) Have a great Easter weekend! Girl, I love those mini eggs so much! Every time I have one, I think it tastes better than I remember. Maybe it's a good thing it's seasonal. Have a great one, Bianca. This is one of the coolest recipes I've ever seen! So creative, fun, and definitely delicious. These are such fun Monica! I am glad to hear that your husband is a Creme egg fan!! Not only tasty but creative fun for all the family! Great idea and Happy Easter! Hey Jo! Thank you! I am wondering how the Cadbury eggs taste in Europe vs. the ones we get here. If I make it across the pond again one day, I'm totally bringing back a ton of Cadbury's because I hear Hershey is not allowing imports of them now. Anyway, always great to hear from you. : ) Have a great Easter and hope you're doing great! haha I like your sense of humor! And how fun are these! I feel like they would be totally unexpected ... especially if you didn't say there was a surprise inside! Have a wonderful Easter weekend!! You are very kind! I'm happy if I didn't turn you off with my corny jokes. : ) These eggs really do crack me up every time I take a look at 'em. I guess it doesn't take much to give me a chuckle. Have a great Easter weekend! I'll tell my hubby you like it, Betty. Thank you! Hope you had a great Easter too. This is a cute Easter treat! It was great...we got to take a little trip. : ) Hope you had a nice one. These are so adorable Monica, my grandkids would love these. Definitely kid-category, Cheri. Thank you. That's so so creative. Why didn't I see this earlier....Well, anyways a good recipe can work anytime. Your hubby sure is a smart one, talking like a food blogger. Love that you stuffed it with goodness. If it's creative, credit to my husband! Thanks, Asha. haha - I know...it was too hysterical not to attempt. Not a peep fan either but they are fun to look at. Thanks, Sue. So adorable! And what a brilliant idea! I don't make Easter treats either but I am bookmarking these for next Easter. I have rice crispies at home and I wish i had seen this post earlier. The boys would have loved them. Awww...that's sweet of you. The kids would definitely crack up, Sonali! haha - yes, it was funny. Easter was very nice...hope you had a good one, too. VERY CUTE!!!! My kids just saw these and got very excited. I said Easter is over... lol. What a great fun idea especially for children! I am so happy your kids got excited! haha. My son thought it was pretty funny, too. The kids have too much fun (and so many treats) at Easter!